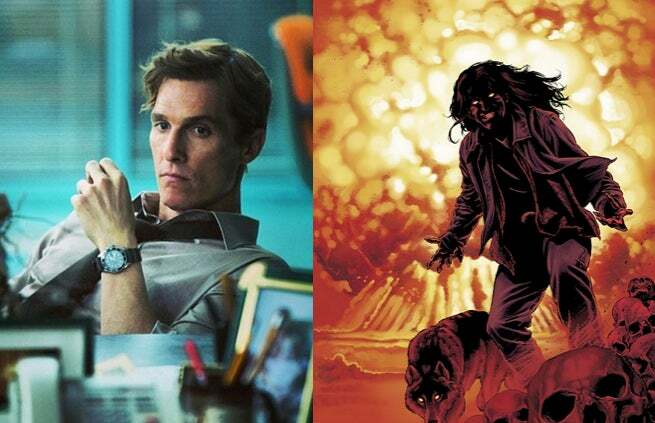 Stephen King’s "The Stand" might enter The McConaissance. Matthew McConaughey is reportedly up for a major role in The Stand adaptation, which director Josh Boone just confirmed as a four-film series. As The Guardian notes, the Interstellar actor would play villain Randall Flagg, the story’s antagonistic cowboy with mystical powers and a massive power base in a post-apocalyptic Las Vegas. "The Stand" is one of Stephen King’s more popular series, spawning a television adaptation in the nineties and a comic book adaptation published by Marvel Comics. The series tells a post-apocalyptic tale where modern civilization collapses under a deadly virus that claims 99.4% of the Earth’s population. Those who survive the plague must fight to avoid extinction at the hands of people like Randall Flagg. Though Flagg made his debut as "The Stand’s" primary villain, he eventually grew to be one of Stephen King’s top recurring characters, appearing in almost nine novels. So while it’s a given that McConaughey would sign up for four turns in The Stand series, the role could potentially give him several other franchises to play in. The Stand is expected to begin filming early next year, though a release date has not been given.